Front Page, The Gazette, 29th September 2015, courtesy of the The Gazette. 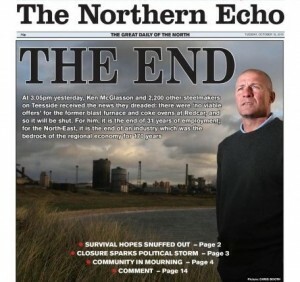 The closure of Teesside steelworks on the north-east coast of England in late 2015 has been heralded as ‘The End’ for steel in the district, bringing the loss of over 2,000 jobs in the industry and with it major knock-on effects ranging from the folding of supply chain firms dependent on the local industry, to cafes, pubs and shops struggling as belts were tightened. In fact, the closure is a continuation of decades of decline which has seen the industry’s labour force in the UK shrink from 320,000 in 1971 to just 24,000 by 2014. Such severe cuts have long since undermined economic confidence in the ability of places like Teesside, and other districts in South Yorkshire and South Wales, to sustain themselves on heavy manufacturing alone. The full severity of the economic impact of the closure of the vast complex skirting the River Tees towards the North Sea is yet to be fully realized and yet, the impact of the imploding global market for steel is about so much more than jobs. In fact, the demise of works has been readily recognized as marking an end to a historical lineage dating back to the birth of Middlesbrough, the rise of the ‘Ironopolis’ and steel production which gained worldwide repute through its use in landmarks such as Sydney Harbour Bridge, nearby Newcastle’s Tyne Bridge and Churchill’s War Rooms. 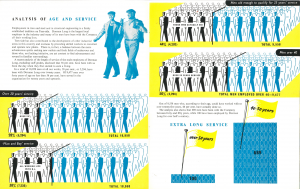 The obituaries which accompanied the end of large-scale steel production on Teesside ranged from local newspaper headlines to reflective national press articles seeking to understand the future for those for whom the industry defined and shaped a way of life. Among the cries to ‘Save Our Steel Makers’, the role of the area’s manufacturing heritage in both articulating the gravity of the ongoing historic event and attempting to make sense of this latest and fatal twist in the story of steel were apparent. In September 2015 as the crisis developed with the plant mothballed, Teesside’s major local newspaper The Gazette referenced the ‘170 years of industry under threat’ alongside fears at the potential loss of ‘Teesside’s lifeblood’. 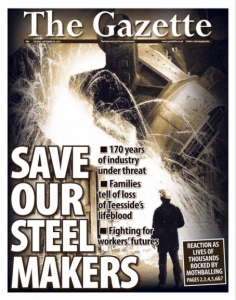 As the axe fell with no buyer or government intervention forthcoming for the SSI site, The Gazette simply led with the headline ‘1845-2015: 170 years of steelmaking laid to rest as Teesside’. Front Page, Northern Echo, 13th October 2015. The Darlington-based Northern Echo adopted a similar theme with its front page adorned with ‘The End’ personified with a portrait of steelworker Ken McGlasson standing dejected before the steelworks, alongside text attempting to capture the contemporary and historic meaning of the event, summarized as ‘For him, it is the end of 31 years of employment; for the North-East, it is the end of an industry which was the bedrock of the regional economy for 170 years’. This process of historicizing the immediate was also evident in national press’ reporting on the end of steel production, with the BBC contextualizing contemporary despair with a feature on ‘Dorman Long: The Teesside firm that bridged the world’ and several news channels and even Match of the Day 2 heading to Teesside in the year following the closure seeking to understand what the cooling of the furnace meant when considered in both wider contemporary and historical contexts. Clearly, the wider shaping effects of steelmaking on towns like those on Teesside, as well as others where the threat of closure loomed large, runs deep. Understanding the full ‘impact’ of industrial decline involves looking beyond the contemporary economic climate by tracing the broader relationship between steel and locality. In the case of Teesside, as with other districts once shaped by heavy iron and steel manufacturing, this is writ large in the physical, institutional and cultural history and heritage of the area still evident in 2017. 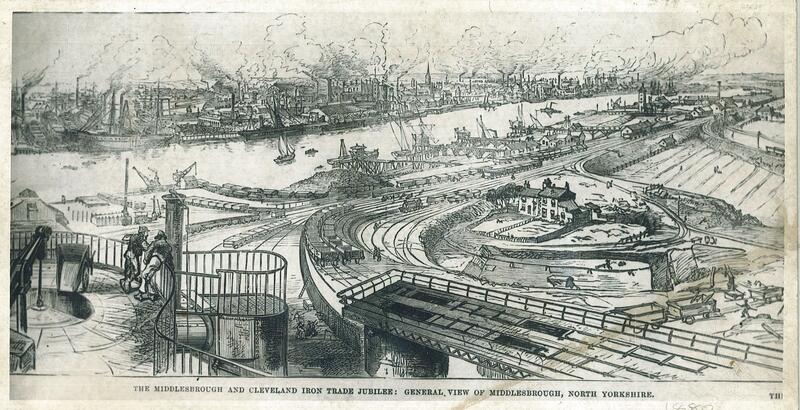 Middlesbrough and Cleveland Iron Trade, 1881, with kind permission of Middlesbrough Libraries. London and Melbourne. Middlesbrough’s boom was truly remarkable as a small hamlet of 25 people in 1801 was transformed a century later into one of the world’s manufacturing centres, with a population in excess of 90,000 bringing with it urban progress (and problems) associated with dependence on cyclical, heavy manufacturing. The discovery of significant ironstone reserves in the Cleveland Hills in 1850 after years of investigation led to the rapid expansion of iron manufacturing led by founding ironmasters Henry Bolckow and John Vaughan, and saw economic migrants flock to the north-east seeking to capitalize on the prosperity offered by this ‘black gold,’ akin to the Victorian gold rush towns found across the Atlantic and in Australia. During an 1862 visit to Middlesbrough William Gladstone was so impressed with the rise of this ‘Ironopolis’ that he hailed the town as an ‘Infant Hercules’, a term extensively referenced in discussions of the area’s heritage and challenges it faces today. 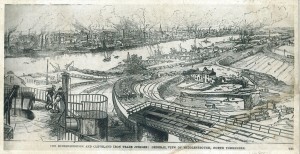 Diversification into steel production in the late-nineteenth century ensured that the area would continue to play a key role in heavy manufacturing well into the twentieth century. Despite long-term downturn in steel manufacturing both in the region and the UK in recent decades, tangible legacies of steel remain on Teesside today and continue to play a key role in the associational, cultural and recreational apparatus of the area. 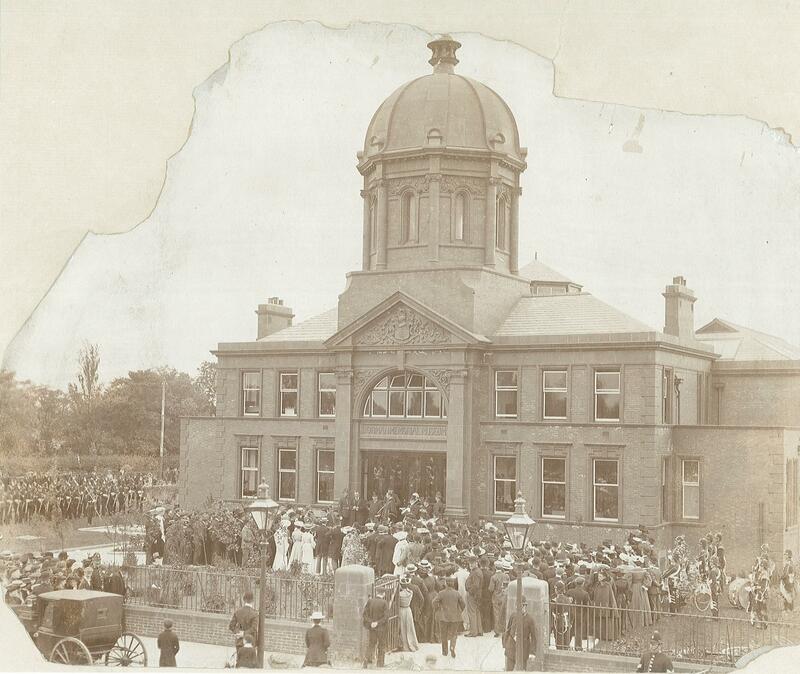 Dorman Museum opening in 1904, with kind permission of Middlesbrough Libraries. One of Middlesbrough’s two main parks, Albert Park was opened in 1868 as the gift of first mayor and Member of Parliament Henry Bolckow to provide open space for use by citizens of the town, later to be flanked by the Dorman Museum (1904) which was provided for the town by Dorman Long co-founder A.J. Dorman and is today Middlesbrough’s flagship museum. Hospitals, libraries and the neo-gothic Middlesbrough Town Hall, adorned with portraits of leading manufacturers Bolckow, Vaughan, Sirs Isaac Lowthian Bell and Hugh Bell, all emerged at least in some part due to paternalistic instincts of the industrial elite. Landmarks of the boom town also emerged which remain on the Teesside skyline, most notably the Tees Transporter Bridge, opened in 1911 with its unique gondola or aerial ferry to transport iron and steel workers across the ‘steel river’ without impeding traffic on this vital industrial artery. Those visiting Middlesbrough today will also encounter a statue of Henry Bolckow outside the Railway Station, unveiled in 1881 during Middlesbrough’s Jubilee celebrations (held a year late owning partly to trade slump), standing on the former site of the Royal Exchange with Teesside Archives located just behind, crammed with the records of the iron and steel firms of Teesside, which include blueprints of steel structures that have helped shape the world. Even those visiting new developments such as the acclaimed Middlesbrough Institute of Modern Art (mima) will encounter a statue of Vaughan remembered alongside fellow industrialist Sir Samuel Sadler in the nearby Centre Square. Yet in towns to the east of Middlesbrough which sprung up to house the workers at the nearby manufacturing plant and shipyards, there is little evidence of the institutions built to serve the industrial communities, with many of the town buildings razed to the ground amidst longer term decline and regeneration initiatives. Further downstream towards Redcar, the new plant built during the First World War as steel production spread eastwards also saw the construction of the model industrial village of Dormanstown in its shadow, yet sadly with the closure of the steelworks the occupational link to the industry in the town is no more. 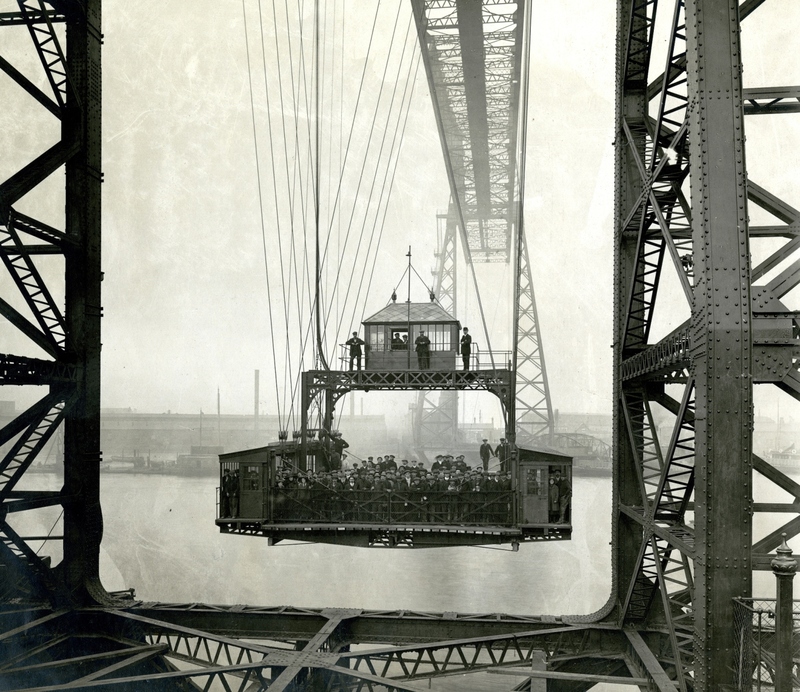 Tees Transporter Bridge – an early-twentieth-century view of a packed gondola, courtesy of Teesside Archives. 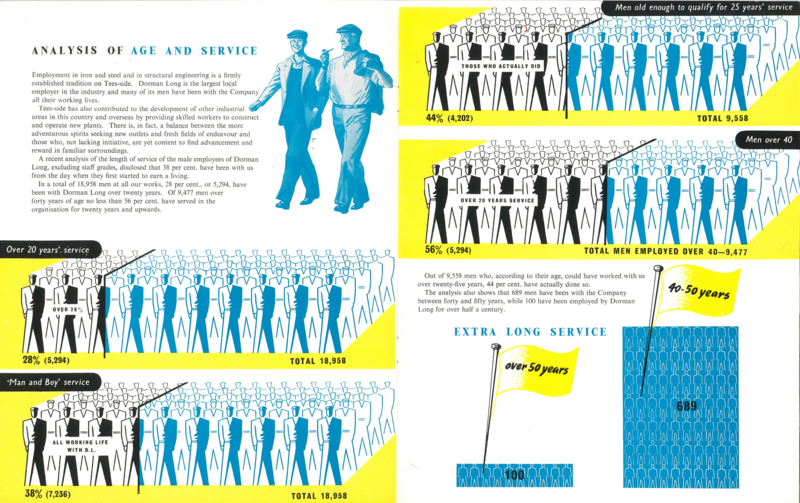 Dorman Long Illustrated 1955 Age and Service, with kind permission of Middlesbrough Libraries. Teessiders. Key recommendations for leisure, environment and tourism stress a ‘need to change the local identity and brand, moving away from over reliance on historic industrial imagery,’ which Opportunity Unlimited offered instead by focus on ‘natural and cultural resources from which there is potential to grow a new ‘Brand Tees Valley’’. Reference to the Tees as a ‘salmon rich’ rather than ‘steel river’ and observations of ‘local sensitivities to being labelled as a place with an industrial heritage’ seemingly displace the immense, inextricable links of iron and steel to the very make-up of the region, in doing so highlighting contentions between celebrating an industry, the relics of which loom ominously on the north-east coast skyline, whilst at the same time seeking new investment, economic prosperity and recuperation. The actions taken to preserve or move on from the area’s industrial history in the coming year will have a significant impact on the ways in which generations of Teessiders, visitors, historians, branding experts and destination marketers understand the identity and heritage of the region and it is vital that the contribution made by iron and steel in places like Teesside is not forgotten. All images reproduced by permission of Middlesbrough Libraries, Teesside Archives and The Gazette. Tosh Warwick is a lecturer in History at Leeds Beckett University and author of a number of books on Teesside history. All views expressed are his own. This blog is derived from research on the impact of steel decline on the wider communities of Port Talbot and Teesside developed with Professor Louise Miskell and Dr Bleddyn Penny, which included an unpublished draft article, as well as a joint conference paper by Professor Miskell and the author entitled “Archives, augmented reality and the industrial heritage of steel towns: Middlesbrough and Port Talbot compared” presented at The British Society for the History of Science Annual Conference held at Swansea University in July 2015. I am grateful to both for allowing this revised version of that work to be presented here. The Gazette, 29th September 2015. The Gazette, 13th October 2015; The Northern Echo, 13th October 2015. A. Briggs, Victorian Cities, (Berkley, 1993), 241-276. Daily News (Middlesbrough), 11th October 1862. Heseltine, Teesside Valley: Opportunity Unlimited, 4-8. This entry was posted in Uncategorised on 9th January 2017 by Grainne Goodwin.